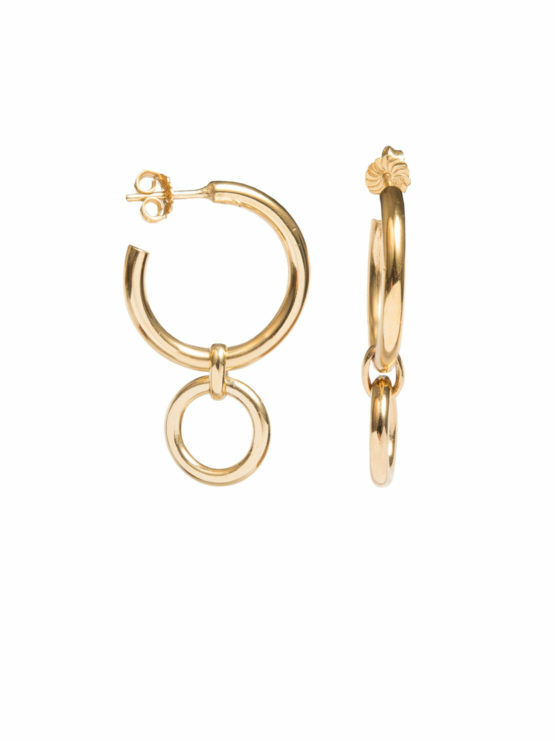 This larger, statement version of our classic-with-a-twist hoop earring features a detachable eternity ring giving you two earring styles in one. Genius eh?! The hoop is 2.5cms in drop with a 1.5cm eternity ring. Easy to wear and easy to know why! Light weight and durable, this solid sterling silver necklace would be a great addition to any jewellery box. The T-Bar itself measures 2.5cm in width and 2cm in length and hangs on a 1.5mm wide 45cm silver ball chain. This small, classic-with-a-twist hoop earring features a detachable eternity ring giving you two earring styles in one. Genius eh?! The hoop is 1.5cms in drop with a 1.5cm eternity ring. These statement making flat-cut, gold plated hoops pack a mean punch with their sleek and elegant form and will instantly upgrade any outfit. The hoop measures 2.5cm. This will become your go to every day necklace, classic and suitable to wear with anything. The large solid sterling silver eternity ring measures 2.5cm in length and 2cm in width and hangs on a 60cm silver ball chain. Matching the mega-sized mood of the season, these extra large, flat-cut, gold plated hoops are the chicest finishing touch to any ensemble. The hoop has a 3cm drop and are 4mm wide. We love the weight of the medium solid sterling silver T-Bar charm, its heavy and hangs perfectly on the stunning silver belcher chain. You can chose the length of the chain, between a 50cm, 60cm or 80cm option. The pendant itself measures 3.5cm in width and 2cm in length. This will become you absolute go to everyday necklace. It's so simple yet so effective and will go wit everything. The nature of the design means its timeless and will be with you forever. The gold ring measures 1.5cm in width and 1.75cm in length. Both the pendant and sterling silver chain have been gold plated in 23.5 K. We have a years guarantee on all our gold plated items so you don't need to worry about any plating issues, we do recommend not to spray perfume directly onto the product and to avoid swimming and showering where at all possible while wearing the necklace.